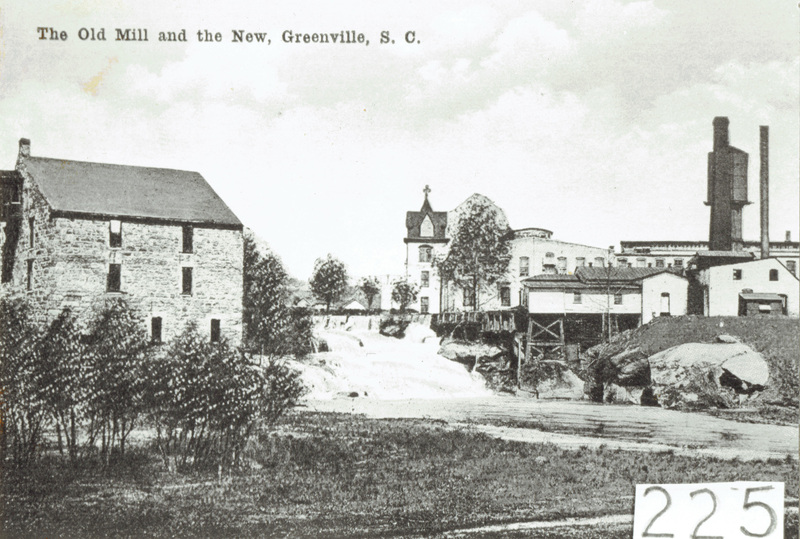 1760s - Greenville was originally founded on the banks around the Reedy River Falls. Our first colonial settler was Richard Pearis. He built his plantation (Great Plains) near Reedy Falls. 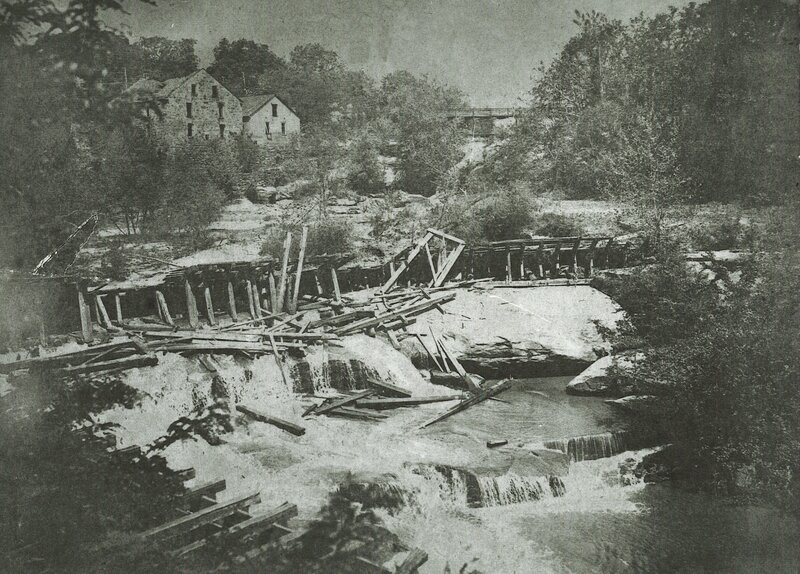 Pearis also built a gristmill on the edge of the upper falls. 1775 - Battle of the Great Canebrake was fought along the Reedy’s banks. 1800’s - Native Americans used the rock shoals at Cedar Falls as a hunting campsite and a way to cross the Reedy River. 1832 - Vardry McBee purchases large area of land, including a grist mill and a saw mill, near what is now Conestee Dam. It is believed that McBee constructed the first significant dam on the Reedy River at or near the site of the present Conestee dam in the 1830s. and is located by the Peace Center and Larkin's by the River. 1837 - Patterson Paper Mill was constructed on the east side of the Reedy River downstream of Brushy Creek and upstream of what appears to be Marrow Bone Creek. 1852 - Furman Institution (now Furman University) established its Greenville location on 50 acres in the West End near the Reedy River. The school purchased land from Vardy McBee on the bluff overlooking Reedy River Falls. 1852 - Greenville Manufacturing Company established where Patterson Paper Mill was located. 1876 - Camperdown Mill Number 2 was built across from the Sampson & Hall Mill at the base of the lower falls. 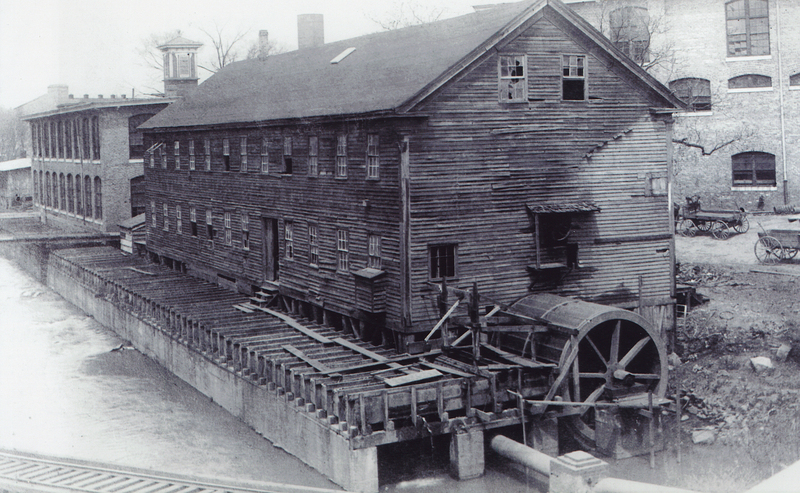 1882 - Huguenot Mill, though built on the Reedy, did not use the water for power, as it was steam-powered. 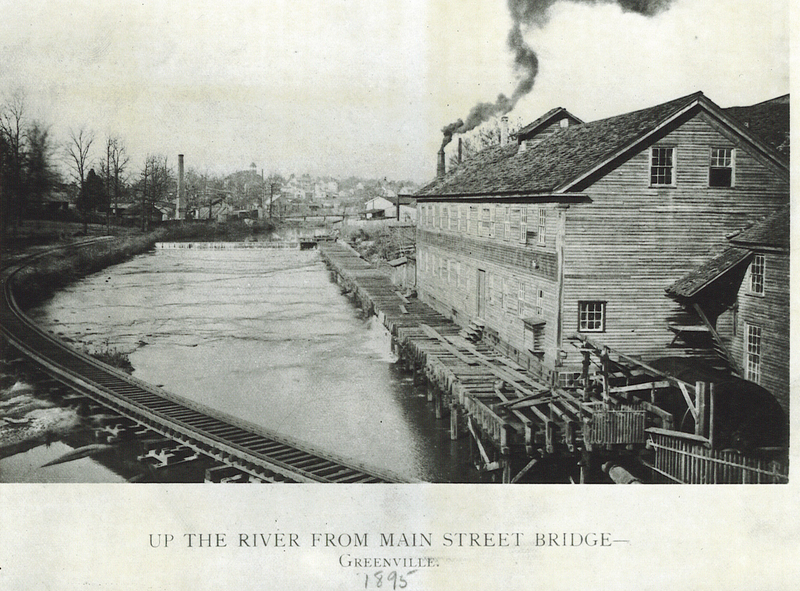 1890 - At this point, there were many thriving businesses on the river in Greenville’s downtown district including a lumber shed, a wheelhouse, a paint shop, a hardware store, and an office building. 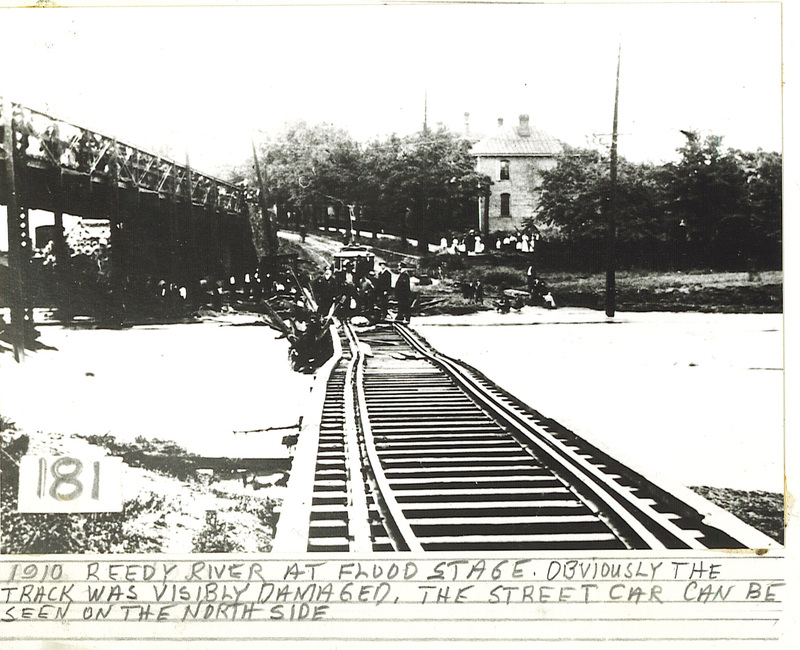 1890s - Greenville built a city sewer system; however, for its first three decades it had no treatment facilities, and instead underground pipes carried untreated human and industrial wastes into Reedy. 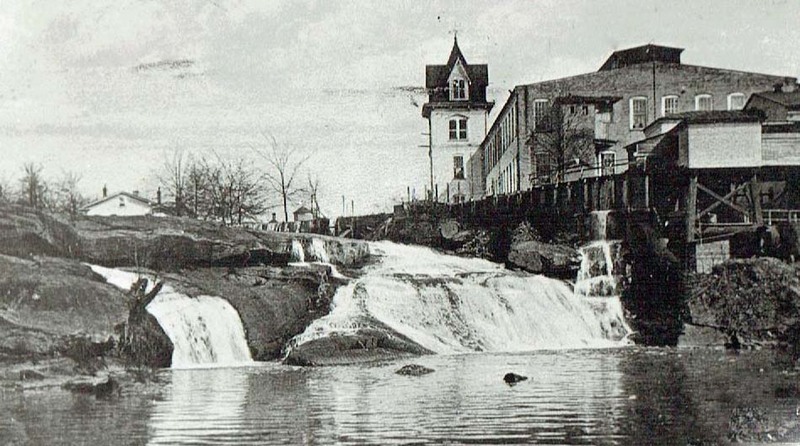 1890 - What is now known as Conestee Mill was constructed beside the Conestee Dam site. 1892 - Conestee Dam constructed to its present height creating a 130-acre lake on the Reedy River. 1900 - By the turn of the century, there were eight mills operating on the river within two miles of the city. 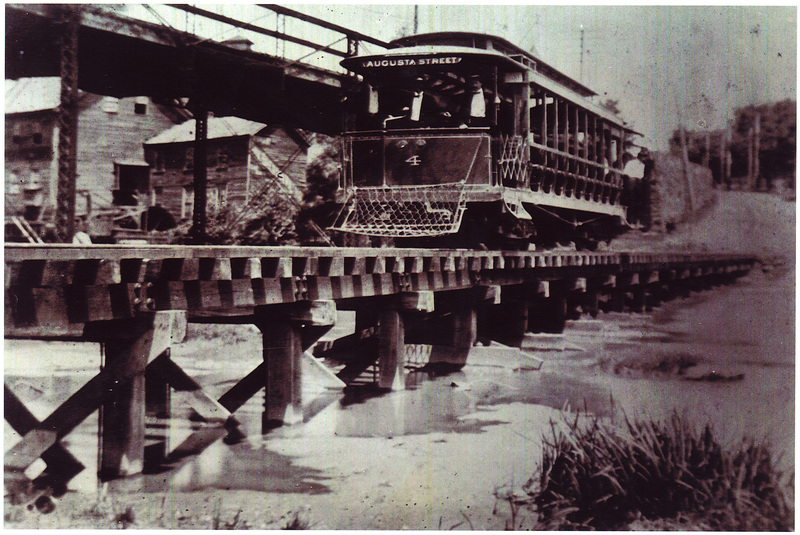 1907 - Reedy River Power Company established which created Boyd's Mill Pond in 1908. 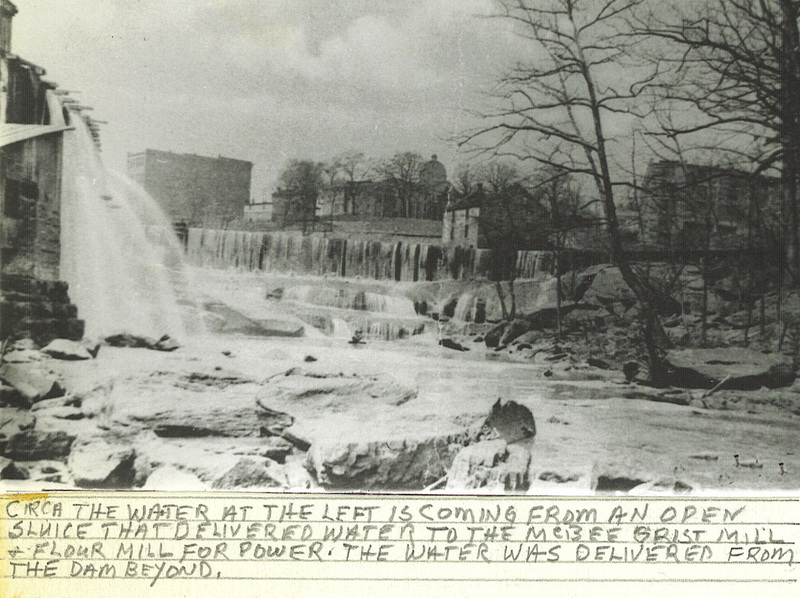 Early 1900s - Greenville literally turned its back on the Reedy as industry exploded on the river. The Reedy was utilized more for its ability to wash away the unwanted, rather than to provide a supply of water power. 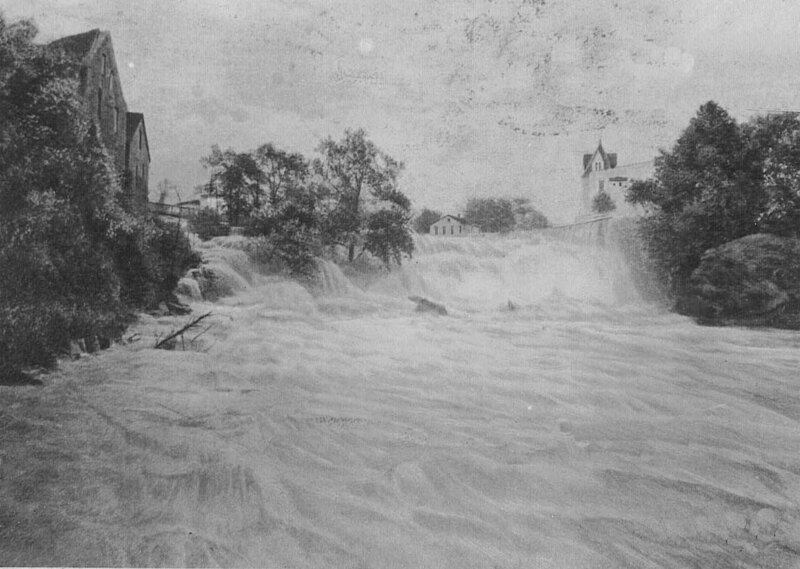 Discharges from the textile operations that made Greenville the national and international center of the textiles industry were discharged without treatment or concern during this period. 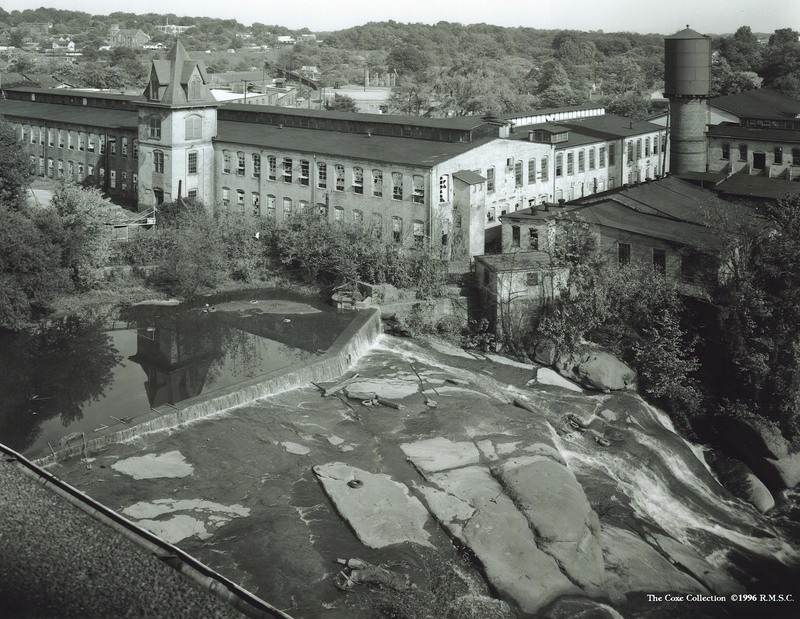 Monaghan Mill, American Spinning, Poe Mill, Poinsettia Mill, and Union Bleachery all discharged their waste and excess dies into the river. 1920s - The Reedy River became the primary stream receiving sewage discharges and urban runoff from Greenville and its rapidly developing suburbs. 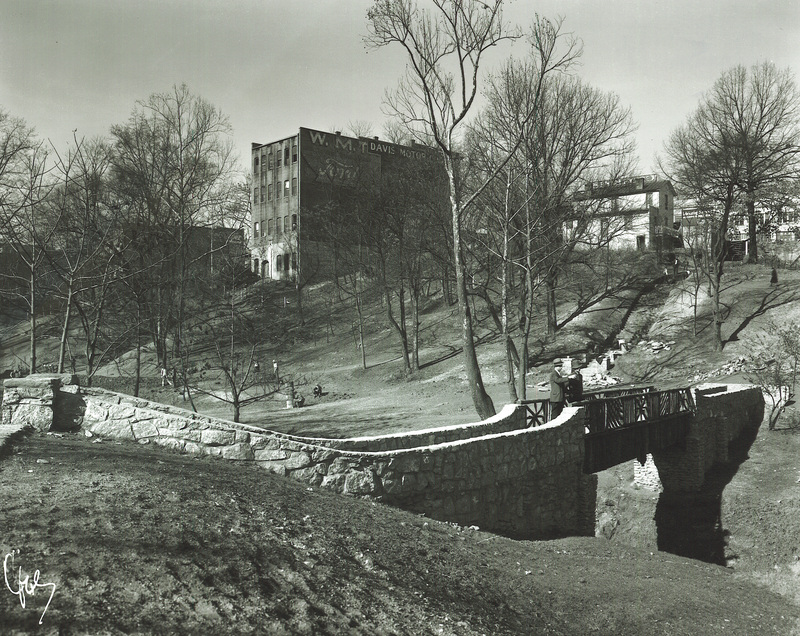 1929 - Rehabilitation of the Falls Park area began with the opening of the Furman University botanical garden and arboretum. 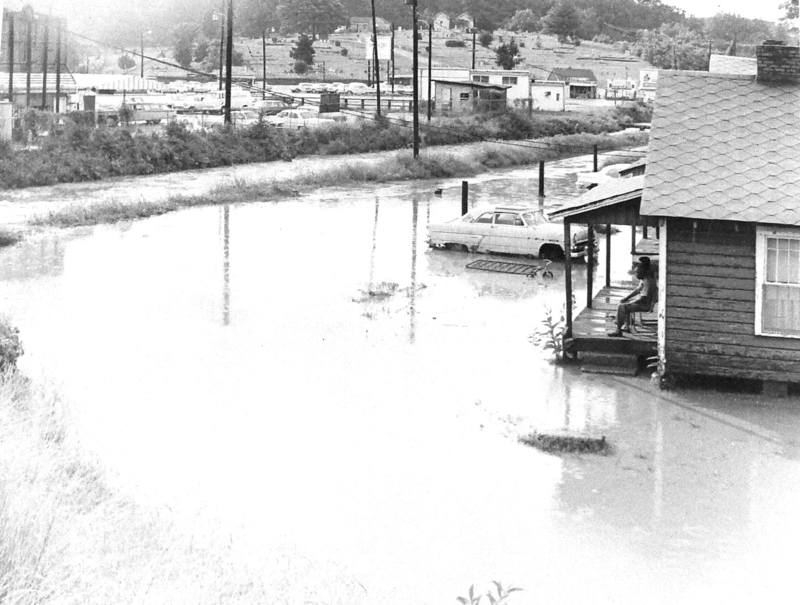 Mid-century - Construction of large project areas including Interstate 85 and the Army Air Base contributed, along with residential developments, to massive deposits of sediment and silt into the river, which eventually ended up in Lake Conestee. The sheer volume of deposits into the lake caused it to go from 145 acres to less than 18 acres by the end of the century. Other sources of pollutants included stormwater runoff, residential trash, pedestrian litter, agricultural waste, sewage runoff, and flooding debris. 1967 - Carolina Foothills Garden Club obtained 26 acres, including 6 acres donated by Furman which is now Falls Park, along the Reedy River. 1972 Clean Water Act (CWA) - The Reedy River was so foul until the 1970’s that no one wanted any association with it, and it had become a corridor for decrepit industry, warehouses, and brownfields. Thanks to the CWA and resulting improvements in industrial discharge permits to include wastewater treatment, water quality in the Reedy substantially improved. 1973 - Reedy River Falls Historic Park and Greenway listed in the National Register April 23, 1973; its boundary was increased November 17, 1978. Early 1980’s - the Reedy ran a different color every day depending on the dyeing operations of the textile plants. 1989 - Mayor Knox White presents the idea of removing Camperdown bridge and improving the area around the river. 1990’s - Community support for restoring the Reedy increased with the formation of Friends of the Reedy River in 1993 and Upstate Forever in 1998. June 26, 1996 - the Reedy suffered a catastrophic setback when a pipeline owned by Colonial Pipeline ruptured near Fork Shoals, releasing over 1 million gallons of diesel fuel into the river, one of the largest inland oil spills in U. S. history. The headlines in the Greenville News in a full front-page story read, “Now They Call It The River of Death!”. The resulting spill was devastating to the Reedy, essentially wiping out the entire food chain throughout a 23-mile stretch of the river. Mammals, waterfowl, and shorebirds dependent upon the riverine/riparian food chain were also affected, or at least temporarily extirpated from the Reedy corridor. 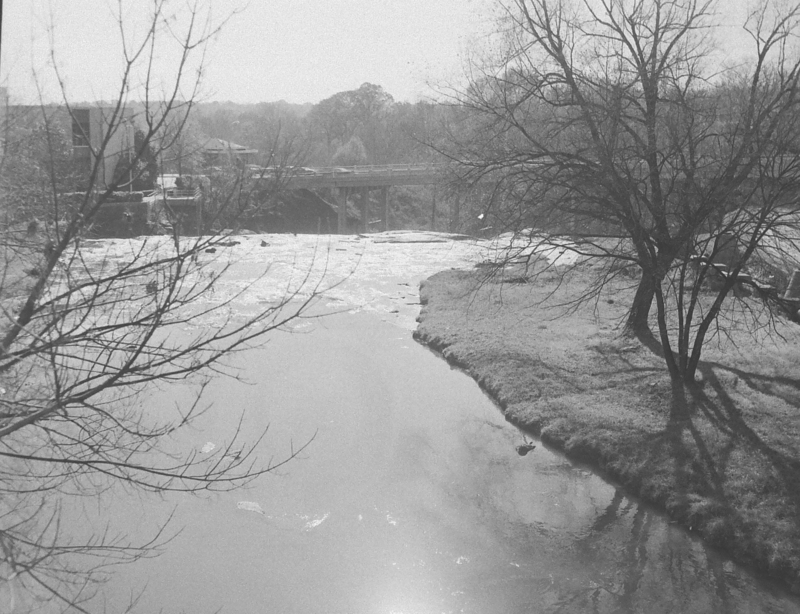 This disastrous spill was particularly incredible because the reach of the Reedy, in southern Greenville and Laurens Counties, had previously been among the more healthy reaches of the Reedy. 1996 - Master Beautification and Development Plan for Falls Park established by the City of Greenville and Carolina Foothills Garden Club. May 2002 - Reedy River Master Plan, a collaboration between Clemson University, the City of Greenville, and Greenville County was developed. 2002 - The removal of Camperdown bridge occurred. 2004 - Falls Park opens (Photo above: construction of a walking bridge in Falls Park. Greenville County Historical Society. Based on a sad history of environmental abuse we recognize that our hometown river, the Reedy, is the historically most polluted river in South Carolina. Greenville’s continuing dependence on the Reedy to discharge its wastes along with its increasing non-point source pollutants, assures that the river faces risks and challenges even today.